Giant Vietnamese real estate developer Vingroup will open 25 new shopping malls across the country this year, the company announced Tuesday, along with a decision to increase investment in a megaproject. The new trade centers will be developed under Vingroup’s flagship brands, Vincom and Vincom Mega Mall, the Hanoi-based realty developer told the media. The new facilities will have an occupancy rate of 70 percent, with Vingroup’s strategic partners and affiliates such as BHD, CGV, Golden Gate, Highlands Coffee, Vinmart, Vinpro, VinKE, Vinpearl Land, and Emigo committed to renting stores there. The Vincom and Vincom Mega Mall chains are developed and operated by Vingroup’s retail unit, Vincom Retail. The company boasts a 90 percent occupancy rate at its existing malls. Vingroup currently has five Vincom malls – two each in Hanoi and Ho Chi Minh City and one in the northern province of Quang Ninh – and two Vincom Mega Mall venues, both in the capital city, according to Vincom Retail’s website. The new shopping malls will be built in 19 provinces and cities,Reuters reported on January 15, citing an email statement from Vingroup. But the cost of this expansion has not been disclosed. Vingroup also announced on Tuesday that it will increase the total capital for the Vincom Mega Mall Thao Dien in District 2, Ho Chi Minh City by VND1 trillion (US$46.6 million). 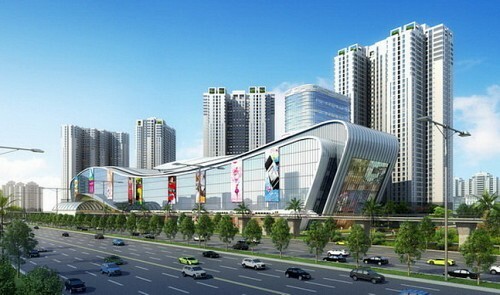 The VND3.5 trillion ($163.11 million) mega-shopping mall will thus become the largest of its kind in the eastern area of the southern metropolis, according to Vingroup. Vincom Mega Mall Thao Dien will be built as part of the Masteri Thao Dien deluxe urban area, which is being developed by Thao Dien Investment JSC. The Masteri Thao Dien project features deluxe shopping venues, cuisine areas, a cinema complex, and a modern entertaining center. Thao Dien is a ward in District 2, known as a hub of luxury villas and apartments. Vietnam has a population of 90 million and the size of its middle class is expected to double by 2020, owing to annual economic growth of over five percent since 2000, according to Reuters. The Southeast Asian country also has the world’s fastest-growing number of super-rich, with Vietnamese holding net assets of at least $30 million projected to swell to 293 from 110 in a decade, Reutersquoted a 2014 report by property consultancy Knight Frank. Vingroup is one of Vietnam’s fastest-growing firms, with a market capitalization of $3.2 billion, whereas its retail arm had total assets worth $1.7 billion last year, according to Reuters. The firm was twice named winner of the “Best Developer Vietnam” category at the annual South East Asia Property Awards in 2013 and 2014. The Asia Property Awards work to showcase the Asian real estate industry, boosting awareness and highlighting top quality developers, projects and services, according to its website.